Development of the F-105 Thunderchief or “Thud” began in 1951. The first prototype flew on October 22, 1955 but the first F-105D (as displayed here) did not fly until June 9, 1959. It entered operational service in early 1961. A total of 833 F-105s were produced, the “D” model was the most widely produced F-105 with a total of 610 built. The principal mission of the F-105 was that of an all weather fighter-bomber. Its highly sophisticated radar system included a terrain guidance mode which permitted the pilot to “let down” through weather in unfamiliar territory and to “ground hug” to avoid detection. This allowed navigation and weapon delivery regardless of route or target weather. 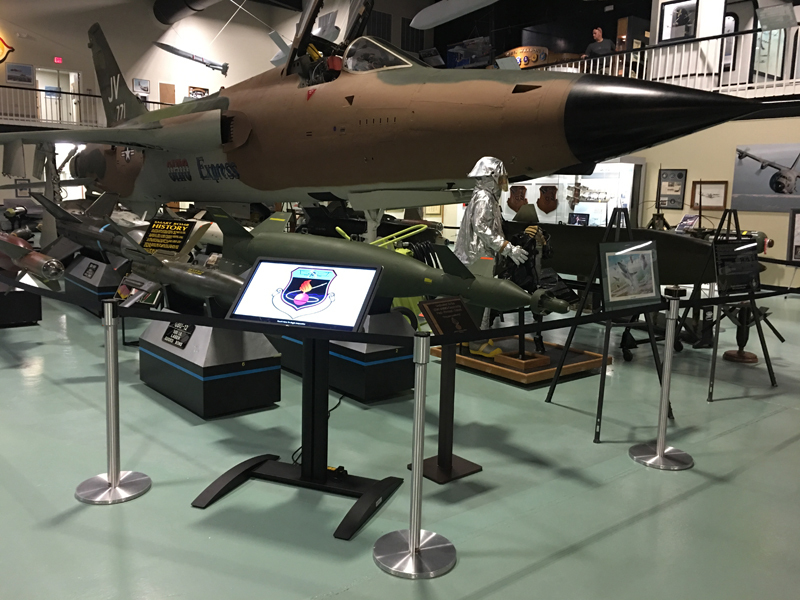 The F-105 Thunderchief first saw action in August 1964 when it deployed to Vietnam. It soon became the mainstay of the USAF’s fighter-bomber force, flying more strikes against North Vietnam than any other aircraft. The bomb bay of the F-105 is longer than that of the B-17 and the F-105 holds a record for the heaviest load ever carried by a single engine aircraft. This F-105D S/N 58-1155 is being depicted as F-105D S/N 59-1771 flown by Capt Peter Foley, the third F-105 pilot to survive 200 missions over North Vietnam. Capt Foley was assigned to the 469th Tactical Fighter Squadron at Korat RTAFB, Thailand.